Adrian Lant took the overall win in the September open monthly competition with his print entitled ‘Buster’, narrowly beating the top placed DPI ‘Extreme Steam Power’ by Robert Evans. 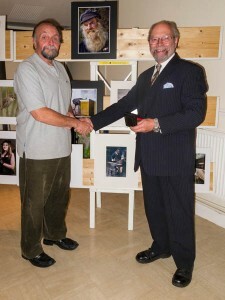 Runners up were ‘Mysterious Encounter’ by Gwynfryn Jones (Print) and ‘Barn Owl Hunting’ (DPI) by Jeff Lewis. The judge was David Alexander from the Vale of Glamorgan. Vince Penticost, the President of the Welsh Photographic Federation, visited Gwynfa last Thursday to present some awards to club members. Heidi Stewart was presented with her missing award from the Welsh Salon. It was a judges choice award from Jim Marsden for her photo entitled ‘The Storm Chaser’. Robert Beynon, Lynda Beynon, Gwynfryn Jones and Steve Littlewood were presented with certificates for having images accepted to the 2015 PAGB Annual Projected Images Exhibition.